So here's a quick round-up of what I've been up to this summer. I've been trying to be a good girl lately ("trying" is the operative word) and eat healthier, so one of my goals this summer was to eat more fresh fruit. I figured that if I made something like a fruit salad, I'd be more inclined to enjoy eating fresh fruit. I've been making this super easy fresh fruit salad for my family. All I do is chop up different kinds of fruit and mix in a little bit of orange juice and honey for a touch of sweetness. I keep it in a big bowl in the fridge so everyone can just help themselves throughout the day. It's so simple but it's so good! This was a last-minute dessert I made for Father's Day. It was a long day and I wasn't even sure if I had time to make anything. So I just threw this together really quickly and thank goodness it turned out delicious. 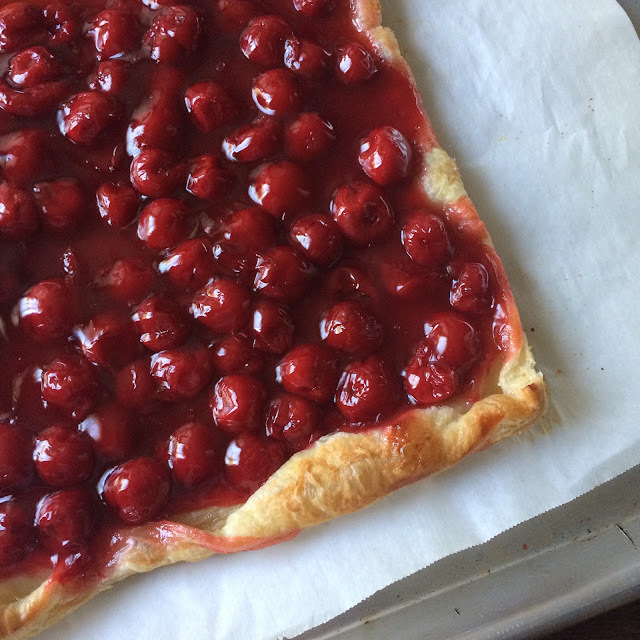 To make this tart, first, preheat the oven to 400 degrees F and line a baking pan with parchment paper. Pour a can of cherry pie filling on a square of store-bought puff pastry, leaving about one inch all around for a border. Bake for 15-20 minutes or until golden brown and puffed around the edges. Serve with a scoop of ice cream if desired. Here's a quick way to frost cupcakes. I made a batch of vanilla cupcakes for my grandma this summer and since she loves lemons, I made a simple icing using a cup powdered sugar and a tablespoon of fresh lemon juice. I just take a spoonful and spread it on top of each cupcake, letting it drip a little on the sides. This icing dries into a shell and won't melt at room temperature, which is great for the summer. For decoration, I sprinkled some dried lavender buds on top. They were the perfect little treat to go along with her afternoon coffee. My cousin Justin is a chocolatier for Norman Love Confections and he recently sent a box of these lovely chocolates for Grandma. I sampled the French Vanilla Truffle and Cherry Cordial Truffle and they were ah-mazing! Frozen fruit jelly cups! I tried these at my cousin Rodney's party and I've been hooked ever since. I've always seen these in big clear plastic buckets at my local Asian grocery store (they're also called fruit coconut jelly) but I never thought of freezing them. It's kinda hard to describe the texture when you bite into this. It's like a sorbet at first but then as its melting, it reverts back to its jelly consistency. Trust me. You're just gonna have to try these. I wish I had a green thumb because I wanna fill my backyard with roses. But since I'm a serial plant killer, I had to find other ways to enjoy my beloved roses. So I got a bottle of rose syrup and rose water to use in a couple of desserts. I tried drizzling them over a simple strawberry tart and making a powdered sugar glaze for scones. But for summer, I'm making this fragrant rose lemonade. Just mix together fresh lemon juice, water, rose syrup, rose water and ice. It tastes and smells absolutely heavenly. I love this book! I've been wanting to learn more about Filipino cuisine, not just how to make them but also the history behind each dish. Memories of Philippine Kitchens is becoming a great resource book for me. Not only is it filled with recipes from different regions of my native country, it also has pages upon pages of vibrant photos and stories from cooks all over the Philippines. If you're interested in learning more about Filipino food, you should definitely take a look at this book. Anyone who knows me knows how much I love listening to music, especially while I'm baking. 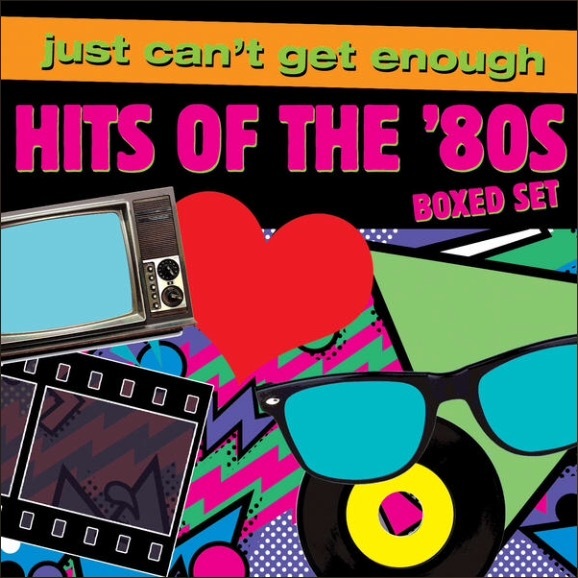 I LOVE 80s music so I got this boxed set from iTunes and it's become one of my favorites. I've also been listening to a lot of 80s-inspired albums like Bleacher's "Strange Desire", The 1975 self-titled album and Taylor Swift's "1989." Seriously, I thought she was singing "and the bakers' gonna bake bake bake bake bake..." LOL And since I'm a huge fan of The Killers, I've been listening to Brandon Flowers second solo album "The Desired Effect" and Ronnie Vannucci's side project Big Talk's "Straight In No Kissin." These albums have been pretty much on repeat this summer.